If you’ve been stressing over how to optimize your SEO for RankBrain, there’s good news: you can’t. Not in the traditional sense of the word, at least. Unlike the classic algorithms we’re used to, RankBrain is a query interpretation model. It’s a horse of a different color, and as such, it requires a different way of thinking than we’ve had to use in the past. 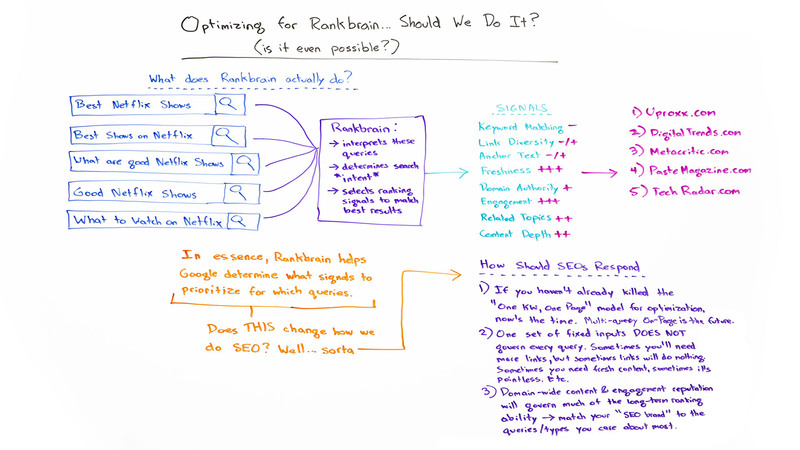 In today’s Whiteboard Friday, Rand tackles the question of what RankBrain actually is and whether SEOs should (or can) optimize for it. Howdy, Moz fans, and welcome to another edition of Whiteboard Friday. 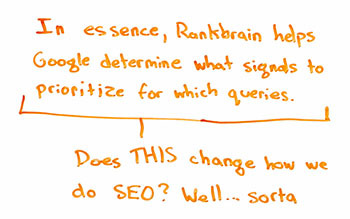 This week we’re going to chat about RankBrain SEO and RankBrain in general. So Google released this algorithm or component of their algorithm a while ago, but there have been questions for a long time about: Can people actually do RankBrain SEO? Is that even a thing? Is it possible to optimize specifically for this RankBrain algorithm? I’ll talk today a little bit about how RankBrain works just so we have a broad overview and we’re all on the same page about it. Google has continued to release more and more information through interviews and comments about what the system does. There are some things that potentially shift in our SEO strategies and tactics around it, but I’ll show why optimizing for RankBrain is probably the wrong way to frame it. So what is it that RankBrain actually does? A query comes in to Google. Historically, classically Google would use an algorithm, probably the same algorithm, at least they’ve said sort of the same algorithm across the board historically to figure out which pages and sites to show. There are a bunch of different ranking inputs, which we’ve talked about many times here on Whiteboard Friday. But if you search for this query today, what Google is saying is with RankBrain, they’re going to take any query that comes in and RankBrain is essentially going to be a query interpretation model. It’s going to look at the words in that query. It’s potentially going to look at things possibly like location or personalization or other things. We’re not entirely sure whether RankBrain uses those, but it certainly could. It interprets these queries, and then it’s going to try and determine the intent behind the query and make the ranking signals that are applied to the results appropriate to that actual query. Anchor text, it doesn’t matter too much, neither here nor there. Why is freshness so important? Well, because Google has seen patterns before, and if you show shows from Netflix that were on the service a year ago, two years ago, three years ago, you are no longer relevant. 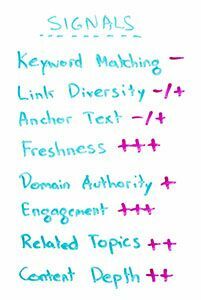 It doesn’t matter if you have lots of good links, lots of diversity, lots of anchor text, lots of great keyword matching. If you are not fresh, you are not showing searchers what they want, and therefore Google doesn’t want to display you. In fact, the number one result for all of these was published, I think, six or seven days ago, as of the filming of this Whiteboard Friday. Not particularly surprising, right? Freshness is super important for this query. Domain authority, that is somewhat important. Google doesn’t want to get too spammed by low-quality domains even if they are publishing fresh content. This is a high-engagement query too. So on low-engagement queries, where people are looking for a very simple, quick answer, you expect engagement not to be that big. But for something in-depth, like “What should I watch on Netflix,” you expect people are going to go, they’re going to engage with that content significantly. Maybe they’re going to watch a trailer or some videos. Maybe they’re going to browse through a list of 50 things. High engagement, hopefully. If you, for example, are talking about the best shows on Netflix and everyone is talking about how hot — I haven’t actually seen it — “Stranger Things” is, which is a TV program on Netflix that is very much in the public eye right now, well, if you don’t have that on your best show list, Google probably does not want to display you. So that’s an important related topic or a concept or a word vector, whatever it is. Content depth, that’s also important here. Google expects a long list, a fairly substantive page of content, not just a short, “Here are 10 items,” and no details about them. So, in essence, RankBrain is helping Google determine what signals to use in the algorithm or how to weight those signals, because there’s a ton of signals that they can choose from. RankBrain is helping them weight them, and they’re helping them interpret the query and the searcher intent. Does that actually change how we do SEO? A little bit. A little bit. What it doesn’t do, though, is it does not say there is a specific way to do SEO for RankBrain itself. Because RankBrain is, yes, helping Google select signals and prioritize them, you can’t actually optimize for RankBrain itself. You can optimize for these signals, and you might say, “Hey, I know that, in my world, these signals are much more important than these signals,” or the reverse. For a lot of commercial, old-school queries, keyword matching and link diversity and anchor text are still very, very important. I’m not discounting those. What I’m saying is you can’t do SEO for RankBrain specifically or not in the classic way that we’ve been trained to do SEO for a particular algorithm. This is kind of different. If you have not already killed the concept, the idea of one keyword, one page, you should kill it now. In fact, you should have killed it a long time ago, because Hummingbird really put this to bed way back in the day. But if you’re still doing that, RankBrain does that even more. It’s even more saying, “Hey, you know what? Condense all of these. For all of these queries you should not have one URL and another URL and another URL and another URL. You should have one page targeting all of them, targeting all the intents that are like this.” When you do your keyword research and your big matrix of keyword-to-content mapping, that’s how you should be optimizing there. It’s no longer the case, as it was probably five, six years ago, that one set of fixed inputs no longer governs every single query. Because of this weighting system, some queries are going to demand signals in different proportion to other ones. Sometimes you’re going to need fresh content. Sometimes you need very in-depth content. Sometimes you need high engagement. Sometimes you don’t. Sometimes you will need tons of links with anchor text. Sometimes you will not. Sometimes you need high authority to rank for something. Sometimes you don’t. So that’s a different model. The reputation that you get as a website, a domain earns a reputation around particular types of signals. That could be because you’re publishing lots of fresh content or because you get lots of diverse links or because you have very high engagement or you have very low engagement in terms of you answer things very quickly, but you have a lot of diverse information and topics on that, like a Dictionary.com or an Answers.com, somebody like that where it’s quick, drive-by visits, you answer the searcher’s query and then they’re gone. That’s a fine model. But you need to match your SEO focus, your brand of the type of SEO and the type of signals that you hit to the queries that you care about most. You should be establishing that over time and building that out. So RankBrain, yes, it might shift a little bit of our strategic focus, but no, it’s not a classic algorithm that we do SEO against, like a Panda or a Penguin. How do I optimize to avoid Panda hitting me? How do I optimize to avoid Penguin hitting me? How do I optimize for Hummingbird so that my keywords match the query intent? Those are very different from RankBrain, which has this interpretation model. So, with that, I look forward to hearing about your experiences with RankBrain. I look forward to hearing about what you might be changing since RankBrain came out a couple of years ago, and we’ll see you again next week for another edition of Whiteboard Friday. Take care.